Sixty artists, three summers, 32 walls and one 2-mile art project you can see for free. The SODO Track is ready for you. The artists seemed mildly anxious about the timing of happy hour. “It’s at 8?” they kept asking each other between bites of sandwiches on a quick lunch break down by the railroad tracks, roughly two miles south of Pioneer Square. The artists were more concerned about losing the daylight, and whether a happy hour would get in the way of finishing their murals. 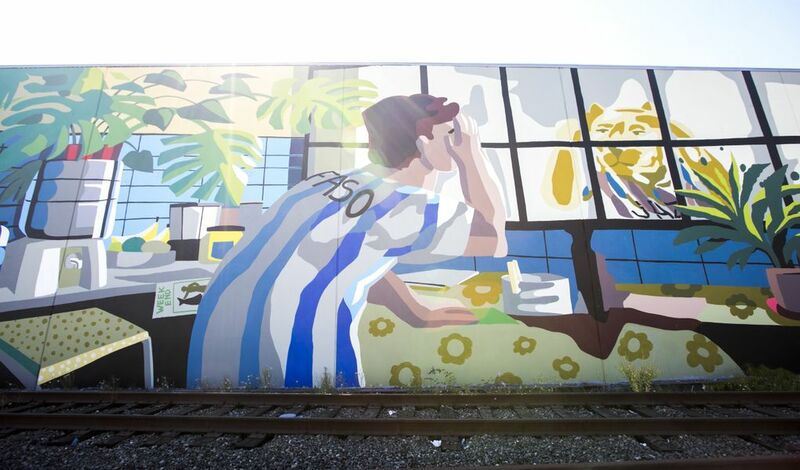 “Let me check my phone,” said Tamar Benzikry of 4Culture, one of the chief wranglers for the SODO Track project, an ambitious public-art undertaking: Three summers, and roughly 60 artists from around the world (about half from the Pacific Northwest) painting dozens of murals on the rear ends of industrial buildings along two miles of train tracks. Benzikry’s phone reported that the sun wouldn’t set until well after 8. The artists seemed pleased they’d have more time to work. Most hastily finished their sandwiches and scurried back into the sun to keep painting. Its aesthetics are all over the place (though the artists were carefully chosen): a fake, vintage-looking ad for “magic ink” by Haifa-based collective Broken Fingaz; a stunningly beautiful, eerie, faceless black figure (a child being yanked back by an adult?) 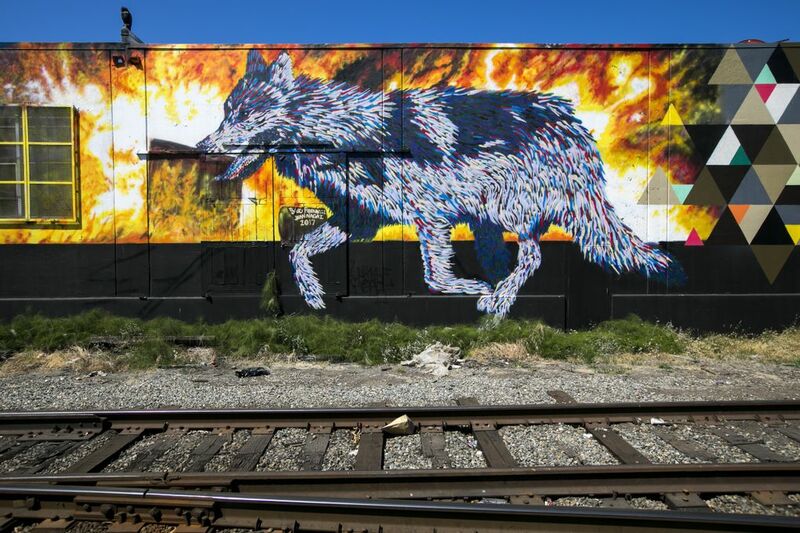 by Alex Gardner; a psychedelic-looking wolf running past a burning building by Baso Fibonacci and Jean Nagai; a large-scale, color-field-ish experiment on corrugated metal by Christopher Derek Bruno; some massive text works, including one that reads “above the clouds,” by San Diego-based Celeste Byers. 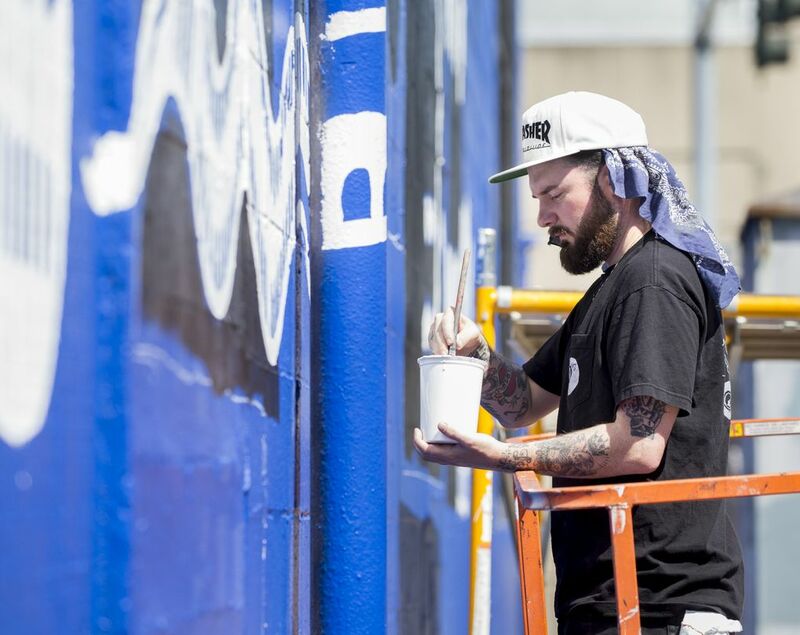 Those artists had been selected, in part, by Gage Hamilton, a longtime street artist and co-organizer of Forest for the Trees, a public-art nonprofit in Portland. Hamilton, curator for the SODO Track project, looked at the various walls along the tracks to see who would work best on what kind of surface (corrugated versus flat, large versus small). 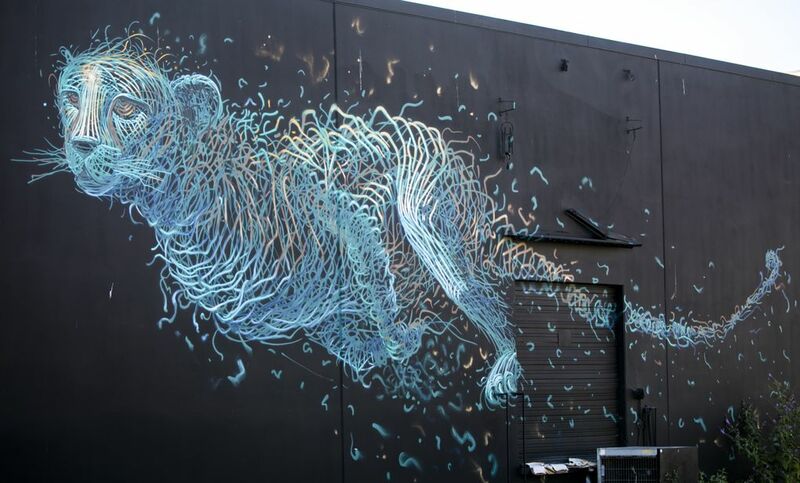 He also thought about what artists would riff off each other’s work while painting next to each other, to create a visual momentum through the 2-mile canvas (playful versus serious, abstract versus figurative, old-school graffiti versus a painting of Chief Seattle’s grandchildren). Benzikry was also going up and down the track, surveying people’s progress and seeing if the artists needed anything. 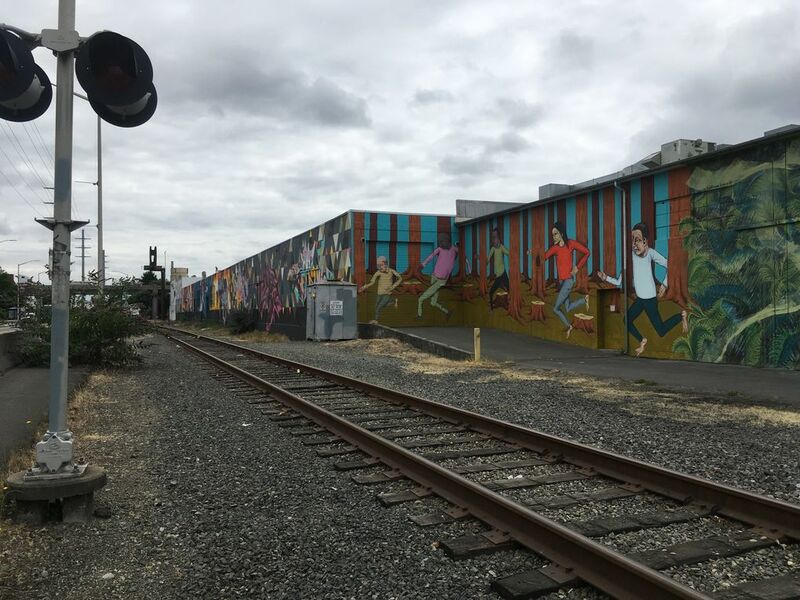 She’d come to 4Culture — a King County arts agency — about a decade ago, and kept hearing people talk about a complicated mural project that would require lots of buy-in: from artists, business owners, neighborhood business associations, Sound Transit, others. 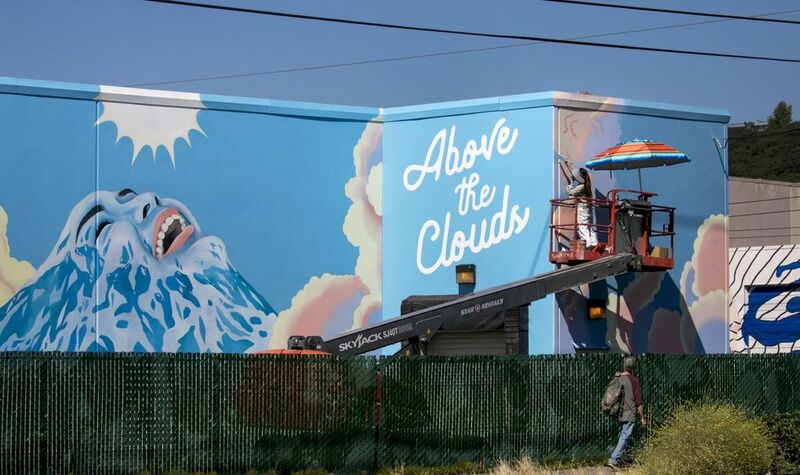 The project has been so successful, she’s been getting calls from across the city — businesses, chambers of commerce, real-estate developers — asking for help finding muralists to paint on their buildings. 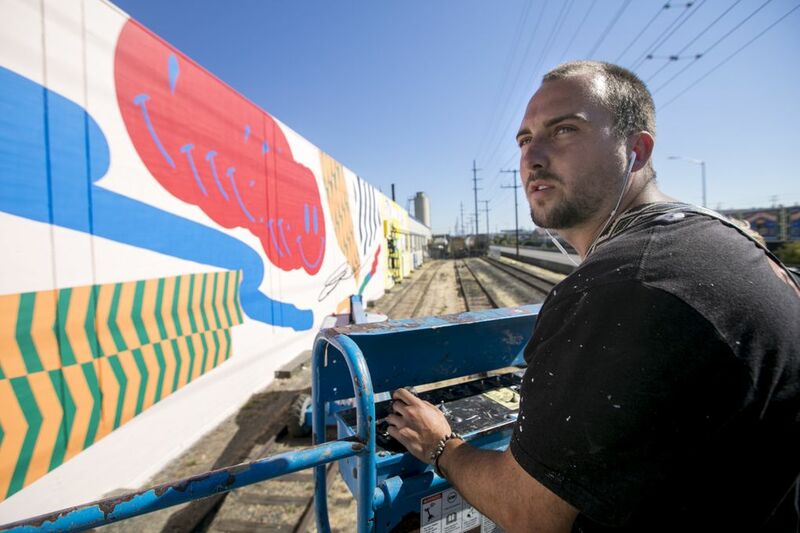 The two-mile corridor that Benzikry and Hamilton have worked to transform is a longtime hot spot for well-respected artists in the graffiti/street art world — but some of the best-loved artwork had fallen into disrepair or been painted over. 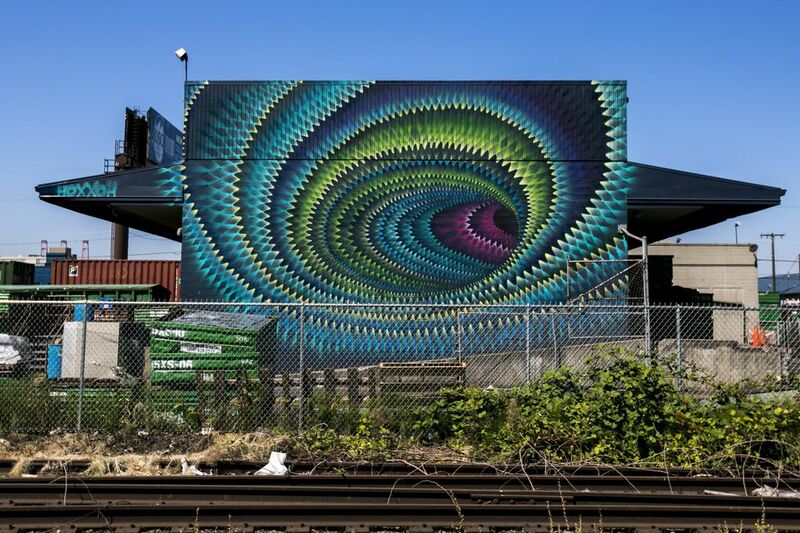 The SODO Track project found a few of the original artists to paint over their own work, on their old walls. Local artist Jesse Brown is one of them. He painted his mural — a study in blue and black of shapes, snakes, eyes, keyholes and sunbursts — over another painting he’d made 10 years ago. “Every wall is a different thing,” he said. But he still has a sharp eye for graffiti, the same way skateboarders have a sharp eye for sidewalks, curbs and whatever else in the urban landscape they can re-appropriate and play with. The aesthetics of the SODO Track are diverse. So are the artists’ backgrounds. 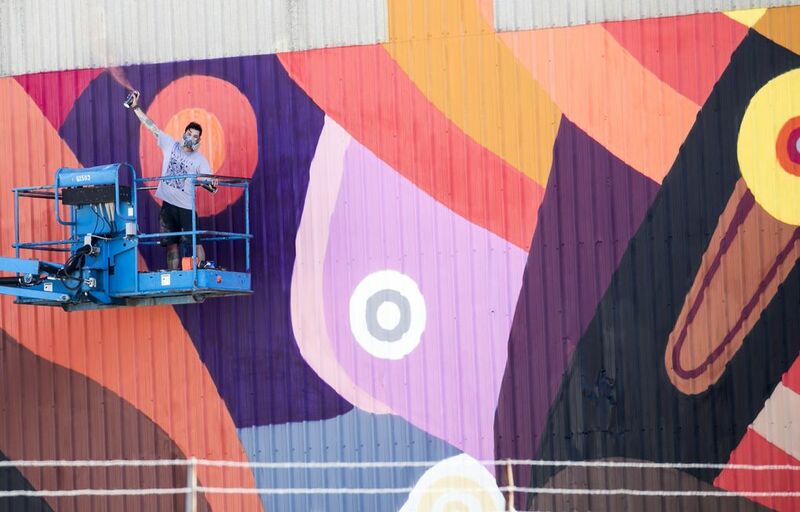 Celeste Byers is from San Diego, and said she got her start as a muralist when her dad — a small-airplane pilot — asked her to paint a wall of his hangar. People noticed her work, and she started getting gigs painting for California medical-marijuana dispensaries. Soon, she connected with environmentalist organization PangeaSeed Foundation, painting in Sri Lanka, Vietnam, Mexico and beyond. 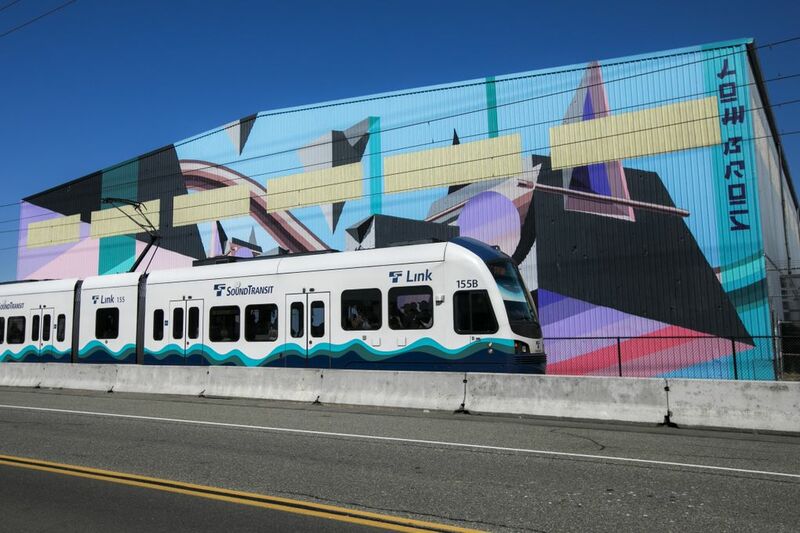 Down the track, commuter Keith Riley — who works for Seattle Labor Solutions — was waiting for his usual bus back home to Renton, and watching the artists at work: mixing paint, squinting in the sun, getting in and out of Genie hydraulic lifts to reach the top of their walls. Earlier, Benzikry had said that was part of the SODO Track idea: To bring some extra visual lift to people’s everyday routines, like waiting for a bus. But she doesn’t want to make “public art” in the cheesy, bland mode that people normally associate with the term “public art.” She wants to help make things that actually get people’s attention — like getting a pack of painters with street cred to make big, weird murals. “I want to do things that encourage people pecking at their phones to look up,” she said. Recently, she was inspired by looking down. Benzikry was visiting a relative in his fancy, high-in-the-sky office in downtown Seattle. She looked out the window at all the rooftops below her and saw them as canvases. 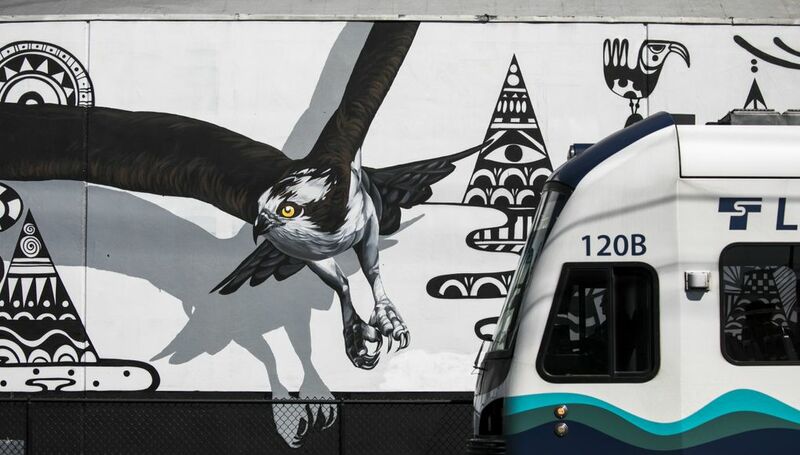 Editor’s note: Since this article’s original publication, Sound Transit and the King County Sheriff’s Office have found several people standing either on train tracks or on a Metro bus-only roadway to admire the murals. Please don’t do that; walking along train tracks and bus lanes is dangerous. Stick to sidewalks at bus stations, or the walk/bike trail that runs parallel to the murals through SoDo.